We are a Burlesque Band to hire, based in London and the South East, and perfect for your event. Jazz, Swing, Gumbo, Soul, Funk, Cajun, Blues…What Band could be better for backing Burlesque Entertainment and playing for Burlesque audiences than the Mississippi Swamp Dogs? If you hire their New Orleans Jazz Band flavoured Gumbo you have a perfect foil for the louche titilation that is the great Burlesque Show. 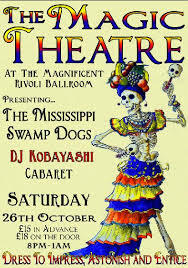 Here are the Swamp Dogs firstly in a New Orleans Promo and then playing as the Burlesque Band for this London Burlesque Evening in Shepherds Bush, Bush Hall, “A State of Undress” Glad to see the band’s eyes on their music taking care of business! The Swamp Dogs have immense musical skill. All the performers have to do is send the band a copy of their music with an idea of the tempo they want it played. The band then turn up early on the day of the performance, rehearse the charts together, then be available to do a dress rehearsal with the Burlesque Performers. Phone us on 020 8761 8932 or 07747 801471. The Burlesque performers can expect enormous cooperation and help from the band, who are there to do everything they can to make the evening a giant success! Just because they are Live London Jazz Band hire doesn’t mean that you cannot hire them for anywhere in the UK. This band will travel! The band can appear as a jazz trio or jazz quartet for more intimate presentations. As well as New Orleans music we also turn our hand to swing too. See here. Jazz hire here. 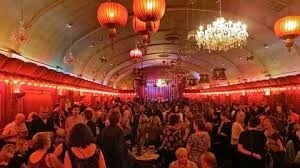 Here is the internationally known Rivoli Ballroom. A gem of a Ballroom that has hosted some amazing Burlesque parties over the years. Every musician who has played here, including ourselves, has nothing but a great love & fondness for this place. It is a direct connection with the past and has been featured on many films, tv shows, videos and adverts. With it’s period features and fabulous “Camp” interior, it is the perfect place to host a Burlesque night. Poster for the Magic Theatre. Burlesque Band. In between the performers acts the bandleader Jeff Williams is happy to compere and announce the evenings proceedings, with years of experience, you can be relied on a funny, snappy presentation! You’re not just getting a Burlesque Band but a whole package! Great Gatsby Jazz Band Hire and Speakeasy Jazz Band Hire is becoming more and more popular. A themed night of 1920’s classics with the band dressed in wing collars and tuxedos could be just what you want for your evening. Info on the 2015 London Burlesque Festival Here Hire our jazz musicians with a confidence !